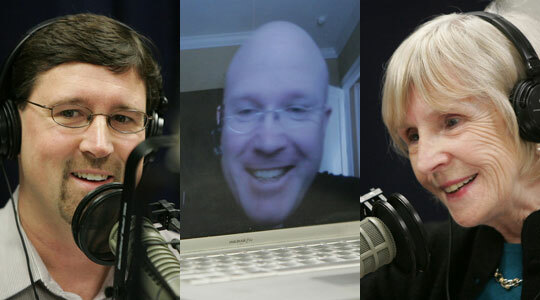 Summary of today’s show: Scot, Susan, Fr. Roger, and Gregory catch up on this week’s headlines, including updates on the religious freedom fight with 7 lessons we’ve learned so far and a great ministry threatened by the new rules; pastor appointments and parish mergers; and how priests are using new media to enrich their faith lives, including something half of priests under 40 are doing; encouraging statistics about the Church; plus much more. 1st segment: Scot welcomed Susan Abbott, Fr. Roger Landry, and Gregory Tracy back to the show. Scot said Fr. Roger on Saturday received Scot’s daughter Ali for her First Communion. They discussed how beautiful and wonderful it is to celebrate the Sacraments for everyone, especially for those he knows are taking their sacrament seriously. Susan talked about how First Communions are a wonderful moment in the life of the Church. She said it may be their First Communion, it should only be the first of thousands of Communions. Greg Tracy then talked about his experience as the father of 10 to celebrate the First Communions of his first six children. 2nd segment: Scot said the editorial in the Anchor is the second of two parts dealing with the battle for religious liberty in the US, especially what we’ve been learning in the interplay between the Obama administration and the US bishops. The first thing Fr. Roger wrote is that we learned about this process is that the administration and many of its friends in the media are trying to make this about contraception, instead of religious freedom. Scot said they hope to make this a wedge issue to bring support from women who would be made to believe that their “right” to birth control is threatened. Fr. Roger discussed the real issue of Sandra Fluke, the 30-year-old political operative attending Georgetown Law, aside from Rush Limbaugh’s ill-considered insults, is that someone spending tens of thousands of dollars to attend school can compel religious believers to act against their conscience to provide her with birth control. Greg said the Obama administration claims to want to resolve this in a way that respects religious freedom, but in reality they show no evidence of wanting to have a real discussion with the US bishops. There is no compromise possible that continues to abrogate religious freedom. Greg said it’s like the administration is promising to say “please” but we’re not allowed to say No in any case. The third point in the editorial is that there doesn’t seem to be the will in Congress to protect religious freedom, so it will be up to the Courts to protect our rights. The Senate failed to pass the Blunt Amendment. The voting on that amendment also show us that Democrats voted against conscience rights 48-3 and Republicans favored it 45-1, so Republicans on Capitol Hill seem to be supportive of religious freedom. Fr. Roger said we have to confront the Democratic Party straight on. There’s something in the party trumping their respect for religious conscience. Scot said the claim can be made that the Democrat Party is being a shill for the special interest of Planned Parenthood. He noted that Planned Parenthood was a big part of the Dept. of Health and Human Services consultation on the services that would be covered under universal health care. The fate of the Susan G. Komen Foundation about a month ago shows that people have a right o be fearful of the political backlash from Planned Parenthood. Fr. Roger noted that 13 Catholic Senators voted against the Rights of Conscience Act, including Massachusetts Senator John Kerry. Scot noted that Democrats often supported the Church’s service to the poor, but they aren’t even on board with the Church when this issue threatens the services that the Church provides. When faced with a situation in which every single U.S. bishop wrote a letter decrying the consequences of the HHS mandate on Catholic and other religious institutions, these CatholiC senators – many of whom who have routinely cited their “conscience” to vote for bills in favor of abortion -still voted against the Church’s being compelled, as the legislation stipulated, to “provide, participate in, or refer for a specific item or service contrary to the provider’s religious beliefs or moral convictions.” Such a betrayal would probably even make Judas blush. Scot said another point is that it’s amazing how much power the Secretary of Health and human Services has been given over religious groups. Those who have examined the text of the PPACA have noted that it contains 700 references to the secretary “shall,” another 200 to the secretary “may” and 139 to the secretary “determines.” The HHS secretary has not only been given unprecedented power over what amounts to be one-sixth of the U.S. economy, but the authority to determine all sorts of things that no unelected official should have. Susan said she found this paragraph frightening. Greg said there are just so many problems we’ve encountered already, what will happen when it’s in full effect? How much more damage will it do? Fr. Roger’s last point is that people need to ask themselves and their legislators whether we want to elect the sort of people who do not respect religious freedom and who believe that free contraception trumps religious freedom. Fr. Roger said in a free country we get the leaders we deserve. We should never elect people who would use their office to take our rights away and get us to fund other’s newly-invented secularist pseudo-rights. As citizens, we have the power to correct these abuses, but we need to rise up and use that power. These are all lessons that, unfortunately, we’ve been learning the hard way. We need to ask candidates completely and substantively about these specific problems with specific answers, not vague assurances. Our votes have become enormously consequential. Scot said the bishops came out a wonderful new statement on this issue that he will discuss on the show with Fr. Mark O’Connell tomorrow. There’s an article in this week’s Anchor about the Little Sisters of the Poor, an order that cares for people at the end of their lives who have no one else to care for them. Now they are having to reconsider whether they will still be able to serve people of all faiths and employ people of all faiths because of the onerous restrictions of HHS mandate. Greg said the Little Sisters of the Poor have a sense of vocation and service and it is a concrete example of the game of chicken that the administration is playing to see whether we’re really going to end our ministry. Greg said what we need to do is march a group of the Little Sisters down to Washington and have them confront some Senators to ask them why they won’t be allowed to continue their ministry. “We wish to affirm that the HHS mandate is an unjust and dangerous infringement upon the natural and constitutional rights of Americans and that the only just solution is to rescind it. The Little Sisters of the Poor call upon Congress and the Executive Branch to reverse this decision as soon as possible and we pledge our prayers and sacrifices for the true good of our beloved country,” the order said. Susan said this statement comes from a group not prone to speaking out on politics or public policy. Scot said columnist George Weigel also wrote this week titled “Religious freedom: It’s not just Pakistan and China.” The need to defend religious freedom comes to the US. Scot turned to local news. Father Brian J. McHugh has been appointed as Pastor at St. Joseph Parish in Somerville. This appointment is in addition to his present assignments as Pastor at St. Ann Parish in Somerville and Pastor at St. Catherine of Genoa Parish in Somerville. He becomes the third pastor overseeing three parishes in the Archdiocese. He takes over for Fr. Henry Jennings who is retiring. Fr. Roger said a decision has been made in the Diocese of Fall River to close the oldest Portuguese parish in the country, St. John’s in New Bedford, and merge it with another parish. They had been slated to close in 2009, but the bishop gave them a chance to raise money to keep themselves open. Unfortunately they fell short in their efforts with support only from 17% of parishioners. Fr. Roger said it helps that the pastor of the welcoming parish has been pastor of the closing parish. It’s sad to see the church close. Scot said the Pilot also has a nice story on the one-year anniversary of The Good Catholic Life. Greg said they wanted to make the story a little more personal rather than a straight just-the-facts story. They wanted to give a little bit of insight for those who may not have heard it before. In the Anchor this week is a story about priests using new media tools to enrich their faith, including smartphone apps, Facebook, Twitter, and Skype. There was a quote from a priest who noted how many young priests at a diocesan priests’ retreat praying on their smart phones. Fr. Roger said he thinks at least half of priests under 40 now pray the Liturgy of the Hours using apps on their phones rather than in a book. It makes it simpler because it’s always with them, they no longer have to worry about the ribbons and flipping back and forth, or switching books between seasons. They can concentrate on their prayer. Fr. Roger said he has his entire priestly library on his iPhone or iPad, including books in his Kindle app. He no longer has to break his back carrying a suitcase of books. He hopes the article helps to inspire laypeople to start taking advantage of the high tech means to keep the presence of the Lord throughout the day. Scot said the iMissal app reads the readings to you, which he likes to do on his way to work. The Anchor also profiles the Pro-Life Office of the Fall River diocese, including stories of how they have helped women considering abortion, not just telling them of the Church’s teaching, but treating them with compassion and giving them alternatives. He told one particularly touching story of lives changed by their work. Pope Gregory begins by talking about Lent itself, noting that no matter how much we are fasting, we should hunger more for the Word of God than for food! When Christ kneels to wash the feet of his Apostles and tells them to love others as he has loved them, we will remember those whom we have fed and clothed and loved in their poverty. Susan said Cardinal Sean often preaches on Holy Thursday on how we need to remember to love as God loves us, which is a high bar. His columns give us some good insight into the Sunday Mass. Scot said there is a column in the Pilot today giving the status of all the divisions in the Archdiocesan CYO March Madness basketball tournaments. He also noted a story giving a statistics on the worldwide Church. The Church’s total population has grown by 1.3%, which outpaces overall population growth. The number of bishops and priests and seminarians grew in the past year as well. There were 412,236 priests as of December 31, 2010 and 118,990 seminarians. The major increases were in Africa, Asia, and Oceania, while Europe saw the greatest decrease.